Esra Bosch Ceramic Studio | Esra Bosch Ceramic Studio, White River, Mpumalanga, South Africa. Esra Bosch Ceramic Studio Esra Bosch Ceramic Studio, White River, Mpumalanga, South Africa. Esra Bosch’s career as a ceramist began in 1985 when she joined her late father, celebrated master potter Esias Bosch, and her brother, distinguished potter Anton Bosch, at the Bosch Studio near White River in the Mpumalanga Lowveld. 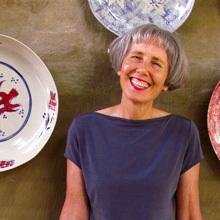 The well-known Bosch Studio, built on a rocky outcrop with a view across to the mountains of Swaziland, was established in 1961 by her father, and this is where Esra still works and where visitors go to view her ceramics. Esra’s artistic training was supervised by her father and from him she learnt the basic skills of ceramics. “The scent of clay, the sensation of clay, the thud of clay being thrown onto a wheel, the clear sound of two fired pots, fresh from the kiln, softly knocking against each other. The language of clay which my parents, Esias and Valerie Bosch, shared with me since my birth in 1951. These are the impressions which my memories are made of,” Esra reminisces. Esias had a disciplined approach to his work and did not tolerate half-measures. His output was enormous and he mastered every aspect of ceramics – and passed his expertise on to his children. “Esias had an impressive work ethic - and such creative energy! He taught me all I know as far as practical issues around pottery, exposure to the many dimensions of raw materials, techniques, approaches, clay-recipes, recipes of glazes and kilns are concerned. In short, I became an apprentice to a potter who taught me how to approach every single aspect related to a fully functioning ceramic studio,” says Esra. Esra’s approach to her career - spanning thirty odd years - speaks of dedication and discipline. Her studio is active and her work space is highly organised. “My days in the studio are filled with activity. With the help of two assistants, I mix my own clay and glazes and every item is handmade – either moulded or on a wheel. I decorate each piece myself. I deal with my clients on a personal basis and spend time with visitors to the studio,” she says. 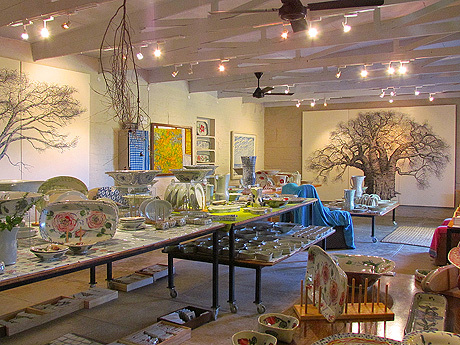 The Esra Bosch Studio – which bears the inimitable stamp of Esra’s late father, celebrated artist Esias Bosch - has been a sought after destination for lovers of ceramics for many years. Built on a granite outcrop overlooking a lush valley with a distant view of the Swaziland mountains, Esra’s studio has become synonymous with friendly, personal attention to clients, so that visitors, local and from foreign lands, return to it time and again when they visit the Mpumalanga Lowveld.